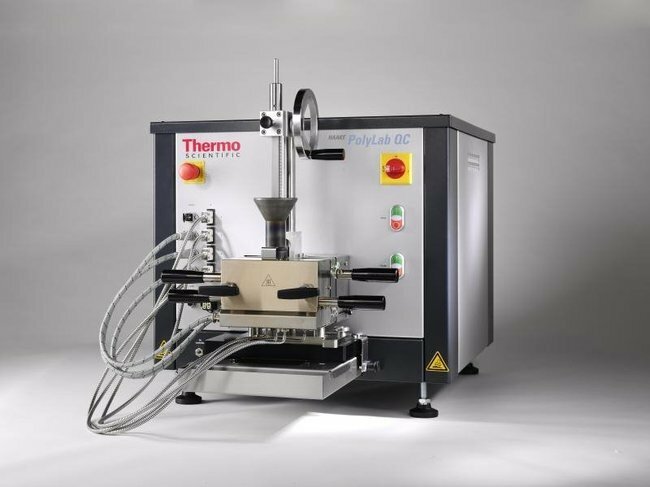 HAAKE™ Rheomix Lab Mixers for the HAAKE™ PolyLab™ OS System Torque rheometer platform are focused on batch testing of many highly viscous substances. Torque rheometer platform are focused on batch testing of many highly viscous substances. Intelligent modular torque rheometer system for the simulation of industrial processes in the lab or pilot plants. A typical mixer test is run at a defined speed (shear rate) versus time, and the material’s response is recorded as torque. The mixing chamber is temperature-controlled precisely by independent heating and cooling zones, but due to the frictional heat in the mixing bowl, a change in the material’s melt temperature is observed and recorded as measuring signal. This «Rheogram» (torque, melt temperature vs. time at constant speed) is characteristic for different materials or blends and often used as a «fingerprint» in Quality Control for incoming or outgoing product inspection. Different additives in type and concentration can be measured and quantified objectively through the melting behavior, consumed energy or melt viscosity (recorded torque).